a shine machine: a cute cute giveaway!! One of my sweet sweet online friends, Eleanor, has offered Run With Scissors readers a chance to win one of her cute handmade dolls in a giveaway!! 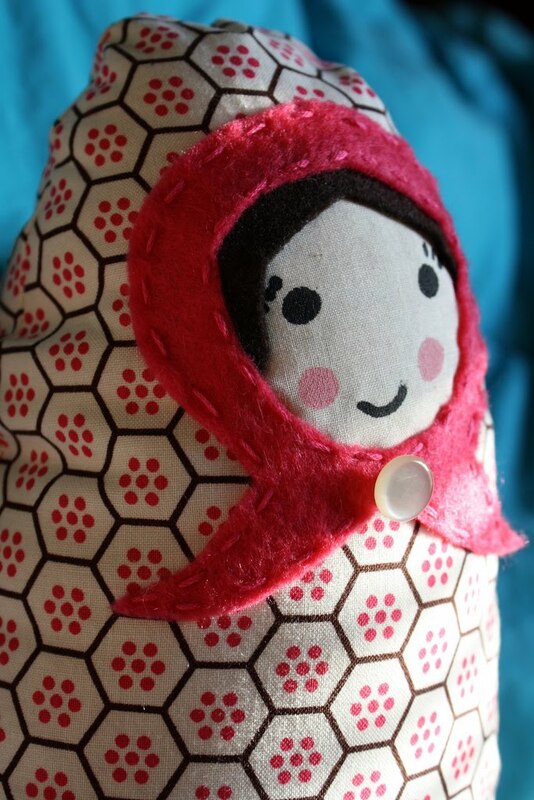 Inspired by Russian Matryoshka nesting dolls, Pita is a plush version of the classic dolls created with Janel & Adam's little Pita in mind! She is made with high quality materials and lots of love. 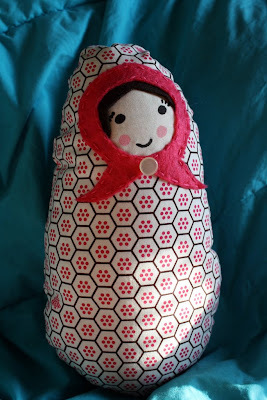 My daughter, whose nickname is coincidentally Pita, helped me design the dolls and even helped stuff many of them! She stands 11" tall and 7" wide at her broadest point. Her body is made using 100% cotton and premium polyester cluster stuffing. Her scarf is felt made from 30% recycled materials embellished with a vintage button. Her face is hand painted on double layered cotton muslin. ** In addition to this giveaway, I'm also donating 25% of the purchase price of any of the other "Pita" plush matryoshka dolls sold in my shop to Janel & Adam!!!! To enter this giveaway, all you need to do is leave a comment on this post telling me your favorite ice cream flavor, your name and your email. Thank you so much Eleanor for offering this giveaway!!! These are absolutely adorable and so is everything else in her shop too!! and her cute cute Etsy shop here!! **The winner will be chosen Sunday evening, August 8!!! This is too too cute!!! My favorite ice cream flavor is Ben & Jerry's Milk and Cookies...seriously BEST EVER. oh my goodness I have to win this doll!!! toooo cute!!! My fav ice cream flavor is chocolate chip cookie dough!!! Mint Chocolate Chip! This doll is super cute! Very adorable doll. Fav. ice cream flavour is cookies and cream. Isn't Eleanor adorable?! I'm so happy that we were paired up through Happy Mail otherwise I might have missed out on knowing this awesome woman! Anyways-as a vegan I don't really get to eat a lot of ice cream (which is still totally cool!) so I am going to cheat and say Lemon Sorbet! On nom nom! Delicious. Mint Chocolate Chip is my favourite ice cream too. Oh my goodness. Those dolls are the most adorable ever. Fave ice cream? Easy. Cheesecake ice cream with heath bar from cold stone. Hands down. My favourite ice cream is definitely mint chocolate chip *but* it HAS to be green !!! YUM !!!! this is sooo cute! My name is Megan but I go by Meggs. My favorite ice cream is mint chip! abzdragon3 (at) hotmail (dot) com. Since I'm commenting anyway- gotta represent the hometown on this one- TURKEY HILL PHILLY'S GRAHAM SLAM! (it might be called grand slam, but it's graham flavored so I'm not sure). My favorite flavor is Hagaan Daaz Baileys Irish Cream. Yummm! my favorite ice cream flavor is mint chocolate chip. i love the color and the taste is even better! Vanilla Ice Cream covered eith chocolate magic shell and sharing it with my favorite daughter. These are so adorable! Would love to win one!! My favorite ice cream flavor is loaded cookies and cream. So good! How cute! My favorite ice cream flavor is vanilla, I know pretty plain, but that's it! my God daughter would adore this doll! Butter Pecan rocks my world. My favorite ice cream is Caribou coffee's java chunk - it's to die for! So sweet of you to do this! My fave icecream is coffee-chip. Yummmmm! COTTON CANDY BY BLUE BELL!! it is a dreeeeeeeeeeam!! everyone had been so supportive of your adoption, Its good to know you have a great online support system! My favorite ice cream flavor is Almond Coconut Delight, it's just SO hard to find! My favorite ice cream flavor is mint chip! These dolls are lovely! Here's to hoping that I win! my fave ice cream flavor is ben & jerry's half baked. yumm. My favorite ice cream? Any really, as long as there's no vanilla in it (for some reason all vanillas taste like rotten milk to me). I love these dolls! My favourite ice cream flavour's dark chocolate! Pita is too cute! I have to win this giveaway my little niece would love it and her 2nd birthday is coming up! My favorite ice cream flavor is vanilla, I know boring but you really can't mess with perfection! MMMM my favorite ice cream is Tiger tail sooo yummy. How sweet! I love that everyone is coming together to support such a wonderful couple. :) Janel, you're soo lucky! Favorite ice cream flavor is definitely Mint Chocolate Chip. I could eat it every day of my life. My favourite flavour is definitely a caramel butterscotch i had on a sunny day at the coast lately - totally yummy! My favorite ice cream is a toss up between rum raisins and dulce de leche, yummy! BTW, these dolls are very cute! OH me OH my! Those are probably one of the cutest things ever. I absolutely LOVE matryoshka dolls. My favorite ice cream is Oatmeal Cookie Chunk from Ben & Jerry's, it's sooo good. AW! 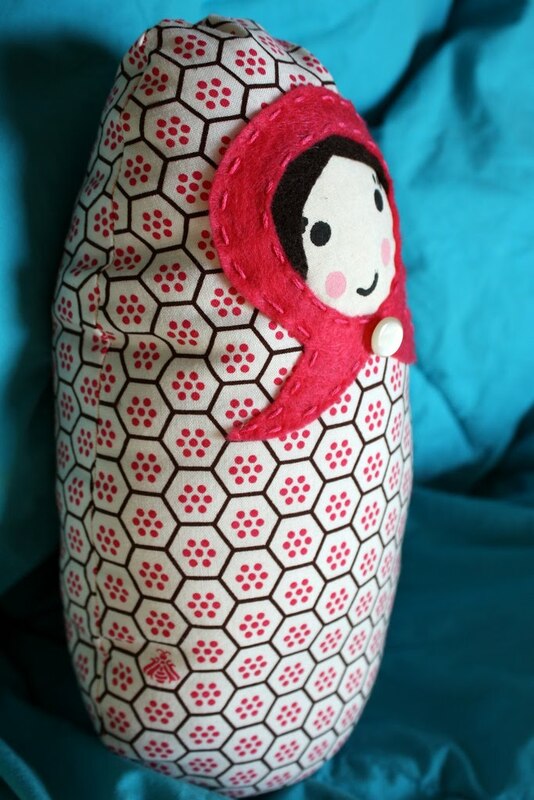 If I were to win, I'd give this to my best friend, a crazy collector of matryoshka dolls!!! This are the cutest dolls ever! My fav. ice cream flavour is pistachio! SOOO good. Bryers Mint Chocolate Chip or Graeters Black Raspberry Chip. yum. My favorite ice cream is moosetracks. It's vanilla with chocolate swirled in and peanut butter cups...yum yum! My favorite flavor is Mint Chocolate Chip. I love chocolate chip...I'm not that interesting. However, I love going to Cold Rock, where they mash up different sweets in an ice cream cup. Yum! Oh I adore russian dolls! This is gorgeous. My favourite ice cream flavou is Stairway to Heaven, yum! Love the doll, how amazingly cute! My favourite flavour is mint chocolate chip. Yum!